Description: Harmless. Smooth scales. Head and body can be gray, blue-black or grayish-brown. Belly is yellow with black spots. 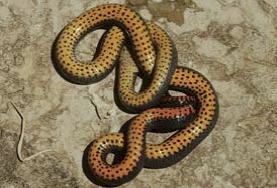 Conspicuous yellow or light orange ring around the neck. Young resemble adults. Habits: Found under rocks and logs in forests, woodland edge, pastures and rocky glades. Active from March-November. Breeds March to April; lays an average of 4 eggs per clutch that hatch by August or September. Mostly eats earthworms. Never bites. 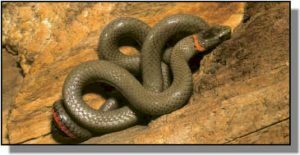 The most common snake in eastern Kansas. When touched on the head, the ringneck will often react by curling its tail and exposing the brilliant orange-red underside in an attempt to startle possible predators.